The first hot firing test was on the high-pressure test rig of the SMILE project partner PLD Space. Central components of the rocket engine developed at the DLR Institute of Structures and Design are the 3D printed injector head and the ceramic combustion chamber. 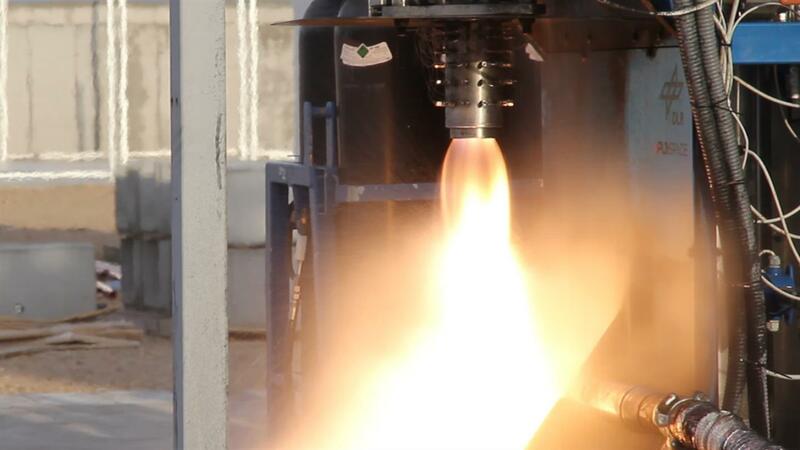 The rocket engine, developed by DLR scientists specifically for this application, consists of two central components – the metal injector head and the ceramic combustion chamber. Belgian project partner 3D Systems manufactured the prototype injector out of a nickel-chromium alloy using metal 3D printing. 3D printing is an additive process. Digital design data is used to build up or rather print the desired structure in layers by depositing material. "Thanks to this relatively new manufacturing technology, we need significantly fewer parts and process steps, which speeds up the manufacturing process for the injector and reduces production costs. At the same time, we have been able to significantly reduce the mass of the components, which is always a very important factor in aerospace applications," says Markus Kuhn, responsible for the project at the DLR Institute of Structures and Design in Stuttgart. The researchers used a special high-performance material for the combustion chamber – a carbon fibre-reinforced ceramic that consists mainly of silicon carbide and was developed primarily at the DLR institute in Stuttgart. It is particularly well-suited for high-temperature applications and reliably withstands even extreme temperature changes. "Reusability was an important consideration in development. If the entire system can be used multiple times, operating costs are significantly reduced, making commercial implementation attractive to companies," says Ilja Müller, Rocket Propulsion Systems Engineer at the Institute of Structures and Design.